Imagine, how pleasant it would have been if you get up early in the morning, check out the Twitter app installed on your phone and your Twitter profile is bombarded with lots of new followers notifications – Sounds good? But sadly, this doesn’t happen with you. Instead of starting the day with happiness, your day starts with frustration, and somewhere the thoughts keep coming like this, “What else I should try to double my Twitter followers count ?“. You must have tried everything and failed to double your Twitter followers count as most of the tips and tricks for getting more Twitter followers is useless except these 21 sure-shot working tips that really help you grow your real Twitter followers. If you have just started out or yet to get your first 100 twitter followers, you may follow these killer tips to get your first 100 real quality followers. However, once you get to 100, 150, 200, 250 – your Twitter followers growth stops, and it is hard to maintain even whatever some followers you have, right? If your answer is “yes” then there is something wrong with your Twitter marketing approach, and you need to fix it. Fortunately, you don’t need to do so many things as you may double your Twitter followers counts without doing anything. Are you wondering how? How to Double Your Twitter Followers Count Doing Nothing? Do you know? 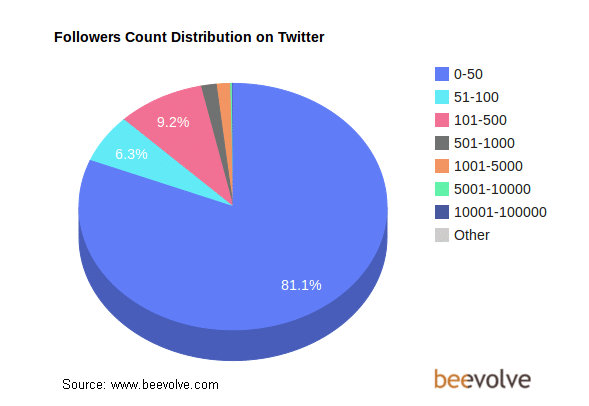 [Tweet “On average a Twitter user has 250 followers, and 6 out of 100 users have none of the followers.”] Beevolve team in their exhaustive study of Twitter users across the world, showed these stats. If you have more than 250, then its quite good but you need to make it even better by doubling followers count. No, doubt to double your Twitter followers count you need to change the way you use Twitter. Changes in your profile, tweet format, tweeting schedule (or whatever else you think needs to be changed) may do wonders in growing not only followers but also engagements. So the best way to start modifications is – start from your own profile because it is your profile that turns strange profile viewers into your followers. So optimize your profile pic, cover pic, bio, etc. in such way that your profile viewers may understand the value of following you as well as what things they’ll be getting from your tweets. Next step is to supercharge your tweeting frequency because the more active you’ll be on Twitter, more will be your followers count. Now you must be thinking, how one can find time from his/her busy schedule to tweet more often? You are right! But the best solution is to automate the process by scheduling. Tools like Buffer and Hootsuite make it super easy for you. Thus you can schedule your tweets to be tweeted on Twitter even when you are away from Twitter. Whether you are trying to get more followers for your business or personal brand, it is recommended that you should try to get real followers to get real connections. This not only helps you grow as an influential dignity in your niche but also improves a number of clicks, re-tweets, favorites, etc. on your tweets, Thus, overall growing users engagements on your profile. Hope this would help you double your Twitter followers count. So what do you prefer – More no. of followers or more engaging followers? Do let me know your Twitter marketing strategy to have more followers.